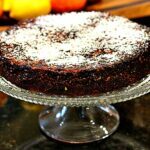 This is a recipe for Chile Chocolate Cake. A beautifully flavored chocolate cake topped with a rich decadent chocolate frosting spiked with bourbon. Chocolate banana bread recipe, super moist, super clever and super delish. Dark chocolate and a cast iron skillet give this banana bread a stunning presentation. With cocoa and dark chocolate this is a lush decadent chocolate bread experience. This is a recipe for homemade hot chocolate sauce that is perfect to drizzle on Vanilla Ice Cream. 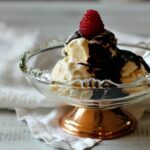 This Mexican Chocolate Sauce gets a kick of goodness from Kahlua Coffee Liqueur and New Mexican chile powder. An adult version of a chocolate treat to use as an ice cream topping and beyond. These Cheescake Black Bottom Chocolate Cupcakes are about to make you extremely popular. With a cream cheese filling hiding inside a luscious chocolate cake. Add a swirl of cream cheese frosting, what’s not to love? 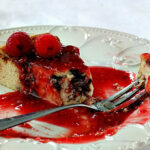 Chocolate Custard Recipe made with Ricotta Cheese and topped with Raspberry Sauce. An easy, yet luxurious dessert recipe to impress the pickiest of guests. Three ingredient chocolate tart. This simple and unassuming little flour-less dessert , is decadent and celebration worthy. Pumpkin seeds and Mexican Chocolate make a delicious combination for this Mexican dessert. 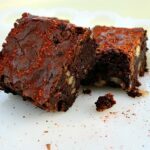 Orange Chile Brownies, Chocolate, orange and chile powder make a great Southwestern, Mexican Brownie. Chocolate Chile Cupcakes. Using America’s Test Kitchen Ultimate Chocolate Cupcake recipe these become flirtatious with some flakes of toasted chile pod.